To provide habitat for the largest diversity of birds, try to include in your plan plants from as many of these plant groups as possible on your property. Choosing plants that produce fruits and seeds at different times of year ensures that your backyard will always have something to bring in the birds. Evergreen trees and shrubs, such as pines, spruces, firs, arborvitae, and junipers, provide excellent shelter and nest sites, and food, for many species. For example, some northern finches specialize on extracting seeds from conifer cones, and some hummingbirds take insects and sap from the tips of conifer branches when they first return in spring, before nectar-bearing flowers are available. Grasslands and smaller stands of grasses and “weeds” provide cover for ground-nesting birds, though they can serve as deathtraps if mowed during the nesting season. They also provide abundant food for many birds. Flowers, especially those with tubular red corollas, attract hummingbirds and orioles. Insects attracted to these plants also serve as food for a wide variety of birds. Various species of cherry, chokecherry, native honeysuckle, raspberry, serviceberry, blackberry, blueberry, native mulberry, and elderberry, provide food for many birds during the breeding season. Dogwoods, mountain ash, cotoneasters, buffalo-berries, and other fall-bearing fruit and berry plants provide an important source of food for migratory birds, both to build up fat reserves before migration and to sustain them along their journey. Non-migratory birds also fatten up on these so they can enter the winter season in good physical condition. Plants that hold onto their fruits long after they ripen in the fall provide a winter food source for winter residents and early-returning migrants; robins, waxwings, Pine Grosbeaks, and mockingbirds are among the birds drawn to fruit trees in winter. Crabapple, snowberry, native bittersweet, sumacs, viburnums, American highbush cranberry, eastern wahoo, Virginia creeper, and winterberry (holly) are all valuable for these birds. Oaks, hickories, buckeyes, chestnuts, butternuts, walnuts, beeches, and hazels provide food for titmice, jays, turkeys, Acorn and Red-headed woodpeckers, and other “mast-eaters,” and insects drawn to their spring flowers provide abundant food to fuel spring migration. These trees also provide nesting habitat for many species. 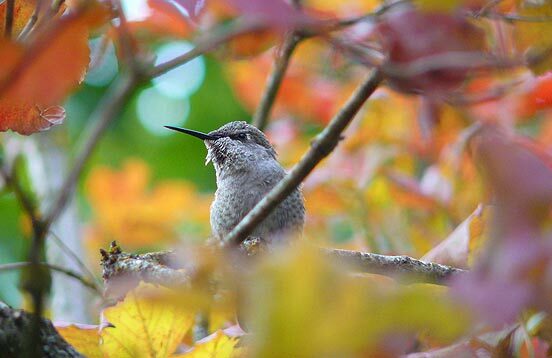 Read more: Here are detailed descriptions of some specific highly recommended plants and trees, including information about the kinds of birds they attract.